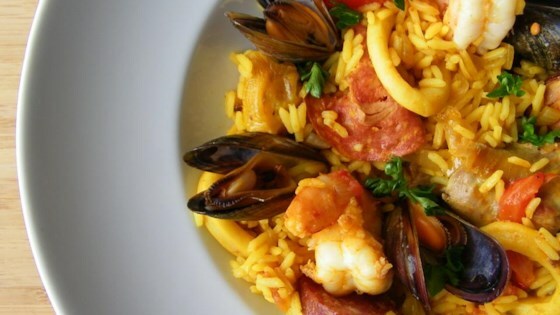 "A very traditional paella, garnished with chorizo, chicken, peas, squid, mussels, and shrimp. Chorizo is a sausage spiced with garlic and chili powder; remove casing before cooking. A paella pan is recommended." Heat olive oil in paella pan over medium heat. Add onion, garlic and pepper; cook and stir for a few minutes. Add chorizo sausage, diced chicken, and rice; cook for 2 to 3 minutes. Stir in 3 1/2 cups stock, wine, thyme leaves, and saffron. Season with salt and pepper. Bring to the boil, and simmer for 15 minutes; stir occasionally. Taste the rice, and check to see if it is cooked. If the rice is uncooked, stir in 1/2 cup more stock. Continue cooking, stirring occasionally. Stir in additional stock if necessary: use up to 2 cups additional stock, 5 cups total. Cook until rice is done. Stir in squid, tomatoes, and peas. Cook for 2 minutes. Arrange prawns and mussels on top. Cover with foil, and leave for 3 to 5 minutes. Remove the foil, and scatter parsley over the food. Serve in paella pan, garnished with lemon wedges. I wouldn't ever use arborio rice for this recipe again, it's too creamy and once it's done the consistency isn't right - paella isn't supposed to be like a risotto. Please don't waste your money on a fancy "paella pan" unless you already have one...or your getting one as a gift but, just to let you know...I've made a fabulous Paella in a Wok.